Previously, the rules for the combat sequence were posted, along with four mecha as examples. Now it's time to look at creating your own. I've made over 40 so far, but I would love to see what others makes out of it. A bit of notice: the rules and names of things are intentionally bland. After the rules, I'll talk a bit about implementing these rules in a game along with a few more examples in another post. Along every step of the creation process, you will need to keep track of the cost, the weight and the energy usage of components. Cost is measured in credits (Kr) and weight is measured in tons (t). Energy usage is not measured in any standard units, they are only important during mecha creation. If the DM chooses, he or she could use gigawatts. The first step in mecha creation is to determine its overall body size. Essentially, pick the number of structural points your mech will have. Each structural point will weigh 1 ton and cost 50 credits. After determining structual points, you must purchase at least one pilot's compartment. Each compartment consumes 3 power, weighs 3 tons and costs 300 Credits. In general, the more powerful the engine, the more massive and more expensive it will be. This is usually the most expensive part of a mech. The third part is purchasing energy shields. Again, the more AC Bonus desired, the more power and money required. Weapons come in five categories: Slug Throwers, Recoilless Guns, Missile Systems and Lasers are the four offensive weapon systems. SAMD's are defensive weapons designed to knock down/avoid damage from missiles. Slug throwers are a class of weapon that hurl a solid object at a target. Usually, the slug is taken from depleted uranium or other super-dense material. The main advantage of slug throwers is that slugs are not easily deflected by shielding. The main drawbacks of slug throwers are their huge power consumption, mass and cost. Still, most mecha have at least one, however small. A slug thrower weapon has 10 rounds of ammo included in its mass when purchased. Like slug throwers, recoilless guns hurl a solid object at a target. However, due to its construction, it is a much lighter weapon. Unlike conventional slug throwers, it allows some of the propellant force to escape from the back of the gun. Recoilless guns are also much lighter than slug throwers. The trade-off however, is that they do not have the range or damage capacity of slug throwers. A recoilless gun has 10 rounds of ammo included in its mass when purchased. Missile Launchers hurl multiple projectiles at a target. Due to their guidance systems, they usually make erratic flight paths to avoid anti-missile defense systems. The result of a successful strike with missiles are several simultaneous hits at different places on a target. The number in parenthesis next to a missile indicates the amount of ammunition included in the missile launcher. For example LR(6) is a Long Range Missile Launcher that can fire six times before running out of ammo. Lasers are energy weapons designed to strip away layers of metal on a target. Lasers can be diffused by shielding, but recent advances in technology still make them potent threats on the battlefield. 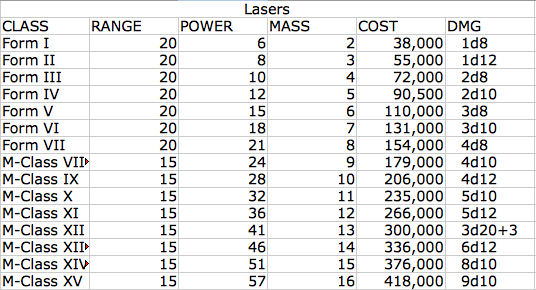 Lasers are relatively inexpensive and powerful weapons that have the longest range of any weapon to date. A laser can be fired as long as the mech has enough power to fire it. Sandcasters represent the cutting-edge in missile defense, despite having a basis in ancient weapons. When missiles are detected, the sandcaster hurls a lot of material designed to explode and/or misdirect missiles to prevent them from striking a mech. Each SAMD is rated for the amount of missile damage it prevents. After assembling all the parts, total the power consumption and subtract it from the Engine Rating. Write down this number, which I'll call the Excess Energy. Total the mass of every part of the mech. Divide the Excess Energy by the Total Mass of the mech to determine the Base Movement Rate. All results are rounded down. No mecha can have a Base Movement Rate above 12. Finally, come up with a name for your new class of mecha. 1. Purchase Structural Points: Lighter Mecha have 40 to 60 structural points. Medium mecha have between 60 and 80 structural points. Anything over 80 is considered to be a heavy or assault mech. Let's create a mech with 75 Structural Points. 2. Select an Engine: Based on the weapons chosen, the engine may change. For now we'll choose a pretty big engine to power the mech, an engine with a 2000 rating. 3. 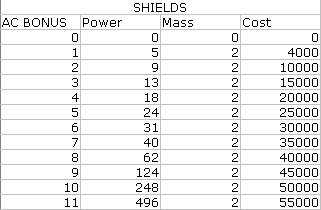 Select Shields: Medium Mecha see a lot of combat. Good shielding is important. 4. Pick some weapons. Most mecha have a mixture of weapon systems. A slug thrower or recoilless gun, lasers, missiles and a SAMD. Sometimes, though, different mecha switch out more missiles for slug throwers. This mech has incredible firepower at short range and is capable of delivering some damage at a distance. The lack of a slug thrower may be considered a weakness, but don't tell the mech pilot that! 5. Do some Math: The total power usage of all the parts of the mech is 115. The engine rating is 2000. 2000 - 115 provides an Excess Energy of 1885. The total mass of the mech is 232 tons. Dividing 1885 by 232 produces 8.125 which is rounded down to 8. I get it, there's a bit to track with this system. To help with Mech Creation, the following link is a LibreOffice spreadsheet that will help you create mecha easily and produce statblocks.